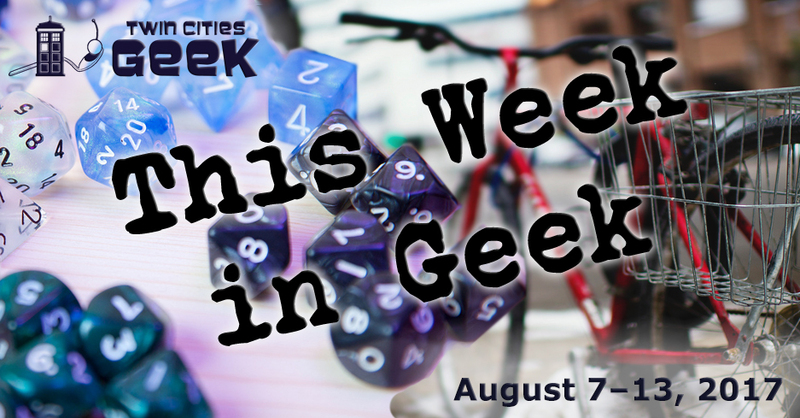 Welcome to This Week in Geek, your guide to events of interest to the Minnesota geek community for the week of Monday, August 7th through Sunday August 13th. When: Monday, August 7th at 6:15 p.m.
Share creative energy with others at Byte‘s creative club. Bring a project to work on, share, or network with others. Bring a friend and build up your creative network. When: Monday, August 7th at 6:30 p.m. Gather with members of the St. Paul Board Game Group for an evening of board gaming and community at Black Dog Cafe in Saint Paul. Bring your favorite game to share if you want, but otherwise there will be gaming goodness for you. The meetup event suggests purchasing food or drink while hanging out. When: Tuesday, August 8th at 6:00 p.m. Celebrate the funny little weirdos who act as the main reason for the Internet to exist with this video festival. See the best videos, listen to music, watch fireworks, and celebrate felines with other cat and cat-video lovers. Doors at 6:00 p.m., but the film reel will start around 8:00. This is an all-ages event; kids get in free and general admission is $10. When: Tuesday, August 8th at 6:30 p.m. Hear some catchy tunes and learn how to dance while experiencing the tapestry of Twin Cities culture at 9 Nights of Music. This weekly event begins with dance instruction before leading to musical performances. This week’s performers are the Dweeb. When: Tuesday, August 8th at 7:00 p.m.
Come and experience YogaQuest, a blend of yoga and fanfiction storytelling led by certified yoga instructors. Experience a yoga workout experience and a story at the same time. This week’s theme is Jessica Jones, so expose your inner strength. Author Benjamin Percy will be reading from his new novel, The Dark Net, a horror story about a ragtag crew working against a growing darkness in the hidden corners of the Internet. Percy will be joined by local writer Marlon James, author of A Brief History of Seven Killings. When: Wednesday, August 9th at 6:30 p.m. Taste Culhane Brewing’s beers and help fund the brewery’s renovation project with this party. Enjoy live music and help a worthy cause in order to keep artistically brewed beer in Lowertown. When: Wednesday, August 9th at 7:00 p.m. When: Wednesday, August 9th at 9:00 p.m. The Minneapolis Park and Recreation Board is presenting movies in various parks throughout the city over the course of the summer, and one showing this week is the original Ghostbusters. Get yourself ready to bust some ghosts in a pre-Giuliani NYC! See the full schedule for all Minneapolis Movies in the Parks here. When: Thursday, August 10th at 6:00 p.m.
Come to GlitchHQ on the second Thursday of every month for an open game of Dungeons & Dragons, welcoming new and experienced players alike. The game is played in an open or sandbox style, so don’t worry about missing individual sessions for overarching story. Just show up, roll up, survive, and level up. Materials and rules provided. When: Thursday, August 10th at 6:30 p.m.
Geek Slink is a bellydance class intended to be a welcoming and safe space to focus on fun, fusion, and fitness. Classes are open to any level of experience, body type, and gender; the 6:30 p.m. session is for beginners, and intermediate classes start at 7:30 p.m. Classes are $15 for walk-ins, or $60 for a five-class punch card. Free trial classes are available. This “un-party” is a chance to grab a beer and meet Jenn Granneman, the author of The Secret Lives of Introverts and creator of IntrovertDear.com. There will be books for purchase and signing, introvert themed prizes, quiet areas to recharge and avoid talking to people, a quiet coloring zone, a live musical guest, a guest reading by Brenda Knowles, and no small talk required. When: Thursday, August 10th at 7:00 p.m. The Girls-Only Comic Club hosts a Weekly Comics Chat on Thursday nights at the Kitty Cat Klub, where there will be “Coffee! Comics! Waffles! Talking!” Additional information about this event is posted on the Girls Only Comic Club’s Facebook group. Individuals interested in attending are encouraged to join. When: Thursday, August 10th at 8:00 p.m. This regular event at Clockwerks Brewing represents the convergence of two geeky favorites: a steampunk-themed bar and absurd trivia. The event is hosted by Sam Spadino and Sidney Oxborough. When: Friday, August 11th at 12:00 p.m. to Sunday, August 13th at 6:00 p.m.
Come to Pixel Paradise for a charitable and inclusive gaming event held to celebrate the gaming community. You’ll find live music, speedrunning, LAN play, tournaments, cosplay, speakers, retro gaming and more. Registration is $30 online ahead of time, or $35 at the door. See event details for schedule information. When: Friday, August 11th at 3:00 p.m. to Sunday, August 13th at 7:00 p.m.
Come to the largest free Irish Fair in the United States for a weekend of music, culture, food, drink, and more. Hear music from a variety of acts, including We Banjo 3, Eileen Ivers, Wild Colonial Boys, the Belfast Cowboys, Socks in the Frying Pan, Screaming Orphans, Aoife Scott, Katie McMahon, and the Tim Malloys. Hear speakers, attend dance workshops, and more. See the fair’s website for details. When: Friday, August 11th at 6:00 p.m.
Mischief Toy Store in St. Paul invites you to experience some Magic with them this Friday night. Entry is $5; all players will receive prizes. This weekly event is limited to 24 players and typically lasts until about 9:00 p.m. All skill levels are welcome. When: Friday, August 11th at 7:00 p.m. This monthly club looks at films and their literary inspirations. Each meeting begins with a bit of social time, then at 7:30 p.m., the movie screening itself begins. Per the event listing, email club organizers for further information. When: Friday, August 11th at 8:30 p.m.
Anime Twin Cities has joined forces with the Geek Partnership Society “to bring a little bit of fun to you on the second and fourth Fridays of each month with this cosponsored anime club.” The group will show various anime movies and series. Follow up Wednesday’s screening of the original 1984 Ghostbusters with the 2016 remake. Ghosts invade Manhattan and must be stopped by a ragtag team of paranormal experts in this hilarious and free moonlight movie at the Normandale Bandshell. When: Friday, August 11th at 9:00 p.m.
Every second Friday, the Gay 90s club hosts ClusterFlux, a sci-fi cosplay party hosted by Symone Smash It. Enjoy live performances from Symone, Eye Dyed, Aveo, and Trey Chic and get your cosplay on. This is an 18-plus event. When: Saturday, August 12th at 8:30 a.m.
After gaining experience with various yoga poses, you’ve earned the right to level up and dive deeper into familiar poses, and even learn new feats (poses). There is a $15 charge for this advanced class. When: Saturday, August 12th at 10:00 a.m.
A whole day of awesome music headlined by Craig Finn of the Hold Steady and Lifter Puller fame (geeks may additionally recognize the Hold Steady’s performance of “The Bear and the Maiden Fair” from Game of Thrones) with beer from Surly, pizza, and brats. Admission is free to this kid-friendly event. When: Saturday, August 12th at 1:00 p.m. This 21-plus event is an opportunity to delve into St. Paul’s beer-soaked past with a brewery tour, which will feature a look at the old Schmidt Brewery and tours of Flat Earth Brewery and Summit. The tour is three hours and includes beer samples in the $50 price tag. Note that there will be a couple of blocks of walking over uneven surfaces. When: Saturday, August 12th at 6:00 p.m.
Come to Source Comics and Games for an evening of science fantasy role-playing excitement as Mutant Crawl Classics (a new postapocalyptic role-playing game) and Metamorphosis Alpha (the classic ’70s game featuring mutants aboard a failed generation ship) are mashed together for irradiated glory. Bring standard RPG dice, but no need to bring books or character sheets; rules will be taught and pregenerated characters will be provided. RSVP via Blogspot or Google+. When: Saturday, August 12th at 8:00 p.m. Witness a live episode of the critically acclaimed dark history podcast Lore with Aaron Mahnke and musical guest Chad Lawson. This will be an evening of stories that will chill, following the podcast’s motto that “sometimes the truth is more frightening than fiction.” Tickets are $35. When: Saturday, August 12th at 9:00 p.m. In addition to Friday night’s screening at the Normandale Lake Bandshell, you also have the chance to see 2016’s Ghostbusters at Phelps Field Park. See the full schedule for all Minneapolis Movies in the Parks here. When: Sunday, August 13th at 11:00 a.m. Celebrate creativity at this free and family friendly outdoor festival co-produced with LaDonna Sanders Redmod of Lavender Sun. This event includes local performers, MCs, DJs, Face Painting, Portaits, Storytelling, Art Projects, and photos of Prince before his ascent to fame. When: Sunday, August 13th at 1:00 p.m.
Pinball and Star Wars come together for this party to celebrate Star Wars Pinball at East Side Pinball. This event is $15, which includes unlimited free play on all pinball machines, a pinball tournament, random drawings, and a custom VIP badge. When: Sunday, August 13th at 12:00 p.m.
Shieldmaiden Sundays is a new dedicated space for female nerds and geeks at Source. This will be a recurring weekly event providing a space for women to play games, chat about comics, cosplay, or just enjoy the company of other geeks. So, which of these events will you be attending? What events would you like to see featured in the future? Let us know in the comments section below or contact us via email. And don’t forget to add your events to the Twin Cities Geek Community Calendar! Jon is a geeky insurance technician with a background in mental-health work and linguistics. He’s into tabletop gaming, B movies, sci fi, fantasy, PC gaming, politics, and community building.